While the product from Harley Farms Goat Dairy might sound strange those who grew up buying paint from the hardware store, it would make much more sense to anyone living before the age of canned paints. In Colonial America, which has become the era most associated with the flat, rustic finish of milk paints, painters roamed the countryside with pigments ready to be mixed with the milk and lime farmers kept on hand. That basic trinity of paint — lime, milk, and pigment — reaches much farther back. King Tut had a dairy-based lacquer in his tomb. Ancient artists may have stuck pigments to cave walls with something like like a milk paint mixture. Now, home hobbyists have picked up on the tradition, starting with skim milk to make paint for nurseries and furniture projects. The FarmPaint project siphons some of the milk from Harley Farms’ award-winning goat cheese operation. But with almost all of the farm’s 200 goats pregnant and due in the spring, Harley expects she should have plenty of milk to meet demand for cheese and milk in the next few years. For 10 years, T.F.B. 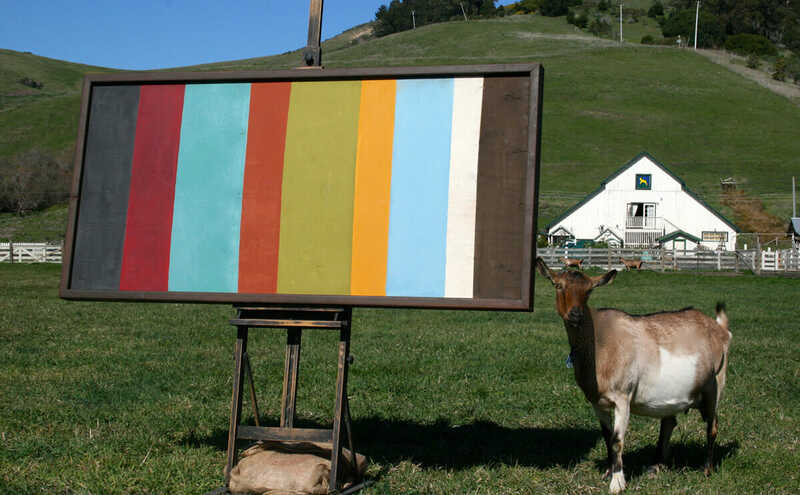 tinkered until he landed on a process that best turned goat milk into goat paint. Rather than starting with raw milk, Harley Farm has the goat’s milk first processed into soap. Alex Warren, a paint specialist in San Francisco, then grates the soap into Parmesan-like shavings and adds flax seed oil, chalk and pigments. The video below gives a thorough overview of the process. Anne Thibeau, President of The Old Fashioned Milk Paint Co. in Groton, Massachusetts had a chance to watch the video. “It’s definitely not a traditional milk paint formula,” she said by email. Warren claims otherwise, saying his recipe is based on a number of traditional milk paint formulas. The main difference between the two paints is that Thibeau’s arrives as a power while FarmPaint arrives as a liquid. Each method has its advantages. Thibeau’s paint keeps indefinitely if kept in a dry state, while FarmPaint becomes less durable as the casein glue in the paint diminishes overtime. But, unlike most powdered paints, FarmPaint can be used on non-porous surfaces and doesn’t require the buyer to do any mixing or measuring. In either case, the paint doesn’t exactly dry on a wall or on furniture — it cures. For a few days after application, there’s a pleasant smell of wet plaster. Once that smell has disappeared, the paint is just about impossible to remove, as are the brush stokes, gaps and mistakes that come with any home paint job. Correction: A previous version of this article stated the name of FarmPaint’s pigment specialist as Alex Murray. His name is Alex Warren. Further, the previous version stated FarmPaint should be used immediately because it curdles overtime, which is inaccurate. We regret all errors.